When I say Crochet Rut, most of you know exactly what I am talking about. Whether you are new to crochet, or are seasoned at the art, chances are, you have or will hit that rut. Do you have too many UFO's (crochet lingo for "unfinished objects")? Are you stuck at your current skill level? Is your yarn stash just... boring? Have you run out of people to crochet for? Do you need a crochet buddy... or five? If you answered "yes" to any of those questions, you just might be headed for a crochet rut. Don't worry, though! 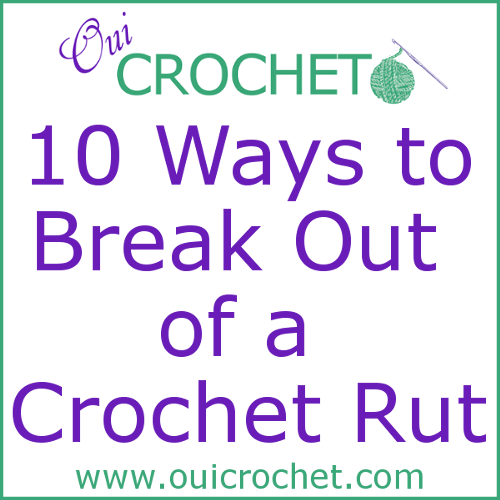 I have compiled a list of 10 ways to break out of a crochet rut. Some of them may surprise you! 1. Revive Your UFOs: Your daunting stash of unfinished projects may be responsible for a little love lost when it comes to crochet.The best thing to do in this situation is to prioritize. Go through all of your UFOs, and start by sorting them into two categories: projects that you don't have enough supplies to finish, and projects that you do have enough supplies to finish. (Now might be a good time to make a list of what you need to finish the projects in the first category.) Next, take the projects that you do have the supplies to finish, and choose. You can choose by which is easiest to finish, which is quickest to finish, or which project appeals to you the most right now. The key here, is to finish one... any... of your UFOs. It will give you a sense of accomplishment, and it will be one less project looming over you. 2. Start a New, Quick Project: Maybe you don't have any UFOs, or maybe you just can't bring yourself to go through them or choose one right now. That's okay! Just start a new project! No. I'm not crazy! If you choose a quick project, one that can be finished in less than a day, you can get that same sense of accomplishment that I was talking about in #1. Many times, it just takes getting a crochet project finished to pull you out of that rut. There are plenty of quick (and free) crochet patterns, from headbands to water bottle carriers, in the Oui Crochet Pattern Gallery. 3. Learn Something New: Learning a new stitch or challenging yourself to a more difficult pattern is a great way to improve your crochet skills. The more skills you have, the more the world of crochet opens up for you. Don't be afraid to take that leap! Check out some of our crochet stitch tutorials and skills tutorials in the Oui Crochet Resources Gallery. Don't forget to go the "old school" way, and check out the crochet books at your local library or book store. 5. Teach Someone to Crochet: Even if you only know the basics right now, you can still teach a friend or family member what you know! Teaching someone to crochet sharpens your skills, and passes along the art to another. For some extra help, you can check out our Learn to Crochet Series here. 6. Crochet for Charity: Do you love to crochet, but have run out of people to crochet for? There are so many charities out there that would love for you to donate your wonderful handmade items. Check out your local hospitals, NICUs, shelters, foster homes, veteran's homes, nursing homes, cancer centers, etc. Donate something warm, or something fun and snugly to brighten someone's day! 7. Visit the Yarn Store: Yes. I am encouraging you to feed the stash monster. But that isn't all. You can get a lot of ideas when you go to the yarn store. Most stores have project sheets on the displays. Or many yarn brands have a pattern right there on the label. Those are fun to look at for inspiration.Or, look at the yarns themselves. There are so many different blends, weights, and colors, that you are bound to find something that "speaks to you". And chances are, while you are browsing the yarn aisles, someone else is shopping for yarn, too. Strike up a conversation. Ask what they are making, what they just finished, and what their favorite projects are. Chatting with someone who shares your passion is bound to get you out of that rut! 8. Browse Amazon's Crochet Products: Too busy to leave the house... or you just don't want to change out of your yoga pants? Or maybe it is 2 am...? That's ok! You can get most of the benefits of #7, just by browsing Amazon. I'm not just saying this because I want to share some affiliate links with you (which, by the way, costs you nothing to click, but does help support Oui Crochet. Thank you!) Have you SEEN their crochet section? So many fun things from yarn bowls, to ball winders, to ergonomic crochet hooks, to yarn cutters and yarn! You can even find some interesting crochet books! 9. Join a Virtual Crochet Group: There are many crochet forums and Facebook crochet groups online. Join one, and jump right in! In fact, we looking for some new, active members in our Oui Crochet Community Facebook group. Come on over and join us! I look forward to seeing you there! 10. Start or Join a Crochet Club: Getting together with others who crochet can be fun, inspiring, and educational. Look for crochet clubs in your church, community center, park district, library, senior center, or community college. Can't find one? Start your own! Chances are, there are others looking for a club to join, too. Are you a high school student? Get together with other students and form a crochet club at school. Crochet items are great for fund raisers for your sports or academic teams, band, or dance committees! There you have it- my 10 ways to break out of a crochet rut! I hope this has helped to inspire you to pick up your hook and create something wonderful. I would love for you to leave a comment and tell me what you do to get out of your crochet rut, or to just tell me what you think about my list. As always, I love seeing your projects! If you make a Oui Crochet project, fee free to share a pic on our Facebook page.